The aim was to evaluate the impact of biofield treatment modality on mycobacterial strains in relation to antimycobacterials susceptibility. Mycobacterial sensitivity was analysed using 12 B BACTEC vials on the BACTEC 460 TB machine in 39 lab isolates (sputum samples) from stored stock cultures. Two American Type Culture Collection (ATCC) strains were also used to assess the minimum inhibitory concentration (MIC) of antimicrobials (Mycobacterium smegmatis 14468 and Mycobacterium tuberculosis 25177). Rifampicin, ethambutol and streptomycin in treated samples showed increased susceptibility as 3.33%, 3.33% and 400.6%, respectively, as compared to control in extensive drug resistance (XDR) strains. Pyrazinamide showed 300% susceptibility as compared to control in multidrug resistance (MDR) strains. Isoniazide did not show any improvement of susceptibility pattern against treated either in XDR or MDR strains of Mycobacterium as compared to control. Besides susceptibility, the resistance pattern of treated group was reduced in case of isoniazide (26.7%), rifampicin (27.6%), pyrazinamide (31.4%), ethambutol (33.43%) and streptomycin (41.3%) as compared to the untreated group of XDR strains. The MIC values of few antimicrobials were also altered in the treated group of Mycobacterium smegmatis. There was a significant reduction observed in MIC values of linezolid (8.0 to 2.0 µg/ml) and tobramycin (2.0 to 1.0 µg/ml); however, very slight changes occurred in the remaining antimicrobials of treated samples. There was no change of MIC values in the strain of Mycobacterium tuberculosis after biofield treatment. Biofield treatment effect on Mycobacterium against anti-tubercular drugs might be due to altered ligand-receptor/protein interactions at either enzymatic and/or genetic level with respect to anti-mycobacterium susceptibility and MIC values of antimicrobials. Global tuberculosis control is facing major challenges now days. Multidrug resistance of Mycobacterium tuberculosis (MDR-TB) has recently become a serious public health burden. Extensively drug resistant TB (XDR-TB; MDR resistance plus resistance to a fluoroquinolones and an aminoglycoside and to at least one of the three injectable drugs kanamycin, capreomycin and amikacin) is a form of tuberculosis which is now a serious threat to human life. Antimycobacterial susceptibility testing is necessary for the proper treatment of patients with tuberculosis through a multiple drug regimen. The key reasons for the development of MDR-TB are due to ongoing bacterial mutation and early discontinuation of treatment . Drug resistance in M. tuberculosis are attributed to random mutations in the mycobacterial genome. All wild type population of M. tuberculosis contain a few mutant strains that are resistant to one of the drugs. These drug resistant strains emerge and become a dominant clone of the population when chemotherapy is intermittent or otherwise inadequate. Tuberculosis has become a threat in the modern era of antimicrobial warfare, because its unique characteristics give it enormous potential for developing resistance to even the strongest antimicrobials . There are various major lacunas associated with currently used directly observed treatment short course (DOTS) regimen in both MDR as well as XDR-TB. The duration and complexity of treatment result in non-adherence, which leads to sub-optimal response like failure, relapse and ultimately developed resistance. Manifestation of adverse effects of anti-TB drugs also contributes a problem of non-adherence. Co-infection of TB and HIV is a problem by itself and prophylactic therapy of latent TB (TB infection without symptoms) with isoniazid is also associated with problems of non-adherence [3-5]. Based on above lacunas there is an urgent need for an alternative way to improve tuberculosis therapy by either enhancing the application of existing agents by means of some alternative strategy or introducing new drugs. Biofield treatment is an alternative approach which may be useful to improve these lacunas associated with mycobacterial resistance. The human biofield’s is the energetic matrix that surrounds the human . It directly links with the cellular activity that allows the DNA to communicate faster than light and maintain intelligence in the organisms . According to universal principles of Maxwell's equations and the principle of reciprocity, it defines electromagnetic connections related to the human biofield . Afterward, Harold Saton Burr had performed the detailed studies on the correlation of electric current with physiological process and concluded that every single process in the human body had an electrical significance . According to Rivera-Ruiz et al. 2008, reported that electrocardiography has been extensively used to measure the biofield of human body . Thus, the cumulative effect of bio-magnetic field and electric field surrounds the human body is defined as biofield. The energy associated with this field is considered as biofield energy and it can also be monitored by using electromyography (EMG) and electroencephalogram (EEG) . Mr. Mahendra Trivedi’s biofield treatment (The Trivedi effect®) has been known to transform the unique structural, physical and chemical properties of materials [12,13], improved the productivity of crops [14,15] and altered characteristic features of microbes [16-19]. Recently, the BACTEC Mycobacteria Growth Indicator Tube System (BACTEC 960/MGIT), a newly developed non-radiometric, fully automated, and continuous monitoring system, has been introduced as an alternative to the radiometric BACTEC 460 for growth and detection of mycobacteria. BACTEC 960/MGIT is a suitable tool for the detection of M. tuberculosis and other mycobacterial species, comprising wide variations in diagnostic performance . The aim of this study was to determine the impact of biofield treatment on XRD and MDR strains of Mycobacterium against susceptibility patterns of antitubercular drugs. Mycobacterial two ATCC strains (Mycobacterium smegmatis 14468 and Mycobacterium tuberculosis 25177) were procured from MicroBioLogics, Inc., USA and other 39 MDR and XDR strains were procured from stored stock cultures, Department of laboratory medicine, Microbiology, P.D.Hinduja National Hospital and Medical Research Centre, Mumbai. The following antimycobacterial agents and twelve antimicrobials were purchased from Sigma-Aldrich such as isoniazide (H), rifampicin (R), pyrazinamide (Z), ethambutol (E), streptomycin (S), kanamycin, ethionamide, p-amino salicylate-Na (PAS), ofloxacin, amikacin, moxifloxacin, clofazime and capreomycin. 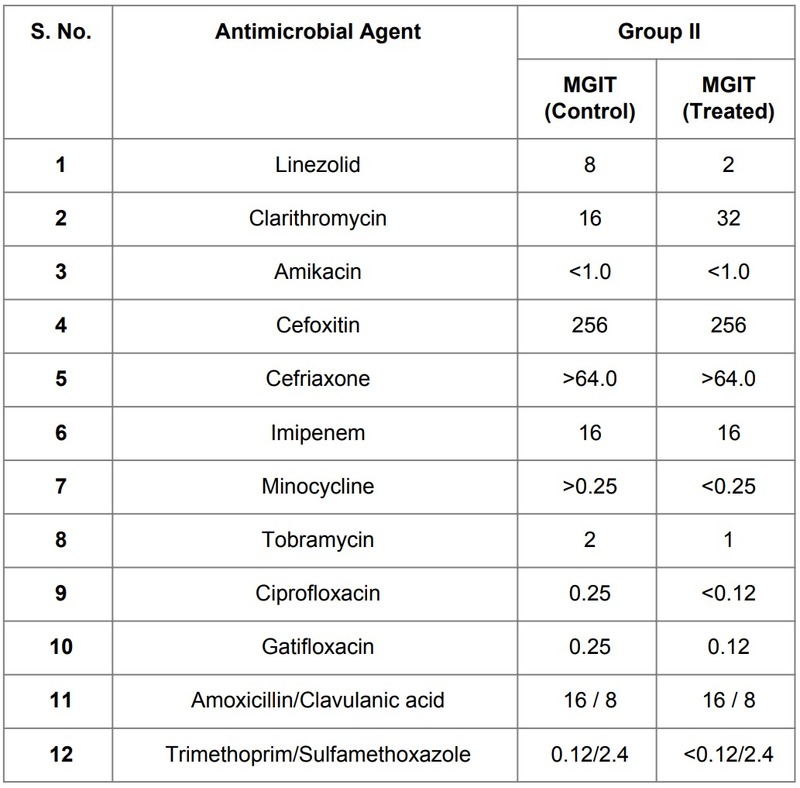 Antimycobacterials susceptibility was assessed using all three generations antitubercular drugs (Table 1) and MIC values were calculated 12 selected antimicrobials such as linezolid, clarithromycin, amikacin, cefoxitin, cefriaxone, imipenem, minocycline, tobramycin, ciprofloxacin, gatifloxacin, amoxicillin/clavulanic acid and trimethoprim/sulfamethoxazole. Antimicrobics were used at the microgram level to assess the MIC breakpoint values as per Clinical and Laboratory Standards Institute (CLSI) guidelines. Mycobacterial strains were grouped into two categories: Group I consisted of XDR and MDR stored stock strains and Group II was consisted of two ATCC strains. 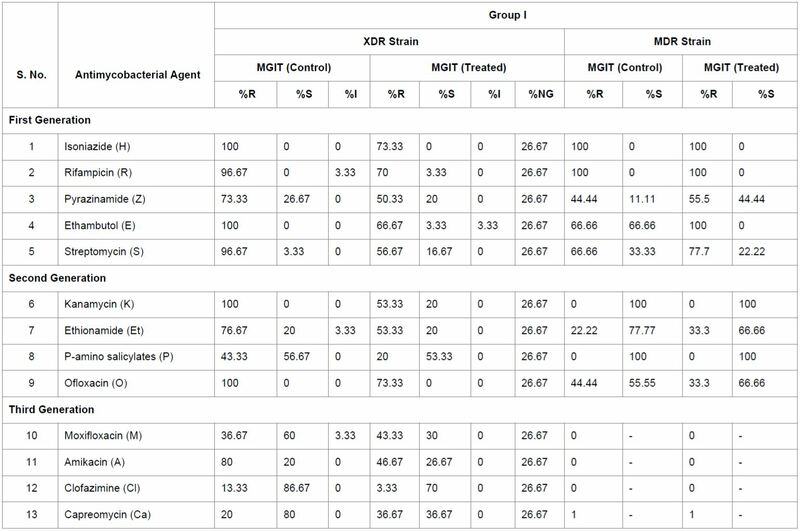 The group I:30 XDR and 9 MDR lab isolates from stock cultures were revived in 2 sets of MGIT vials. The first set was considered as control. No treatment was given to this set. The second set of MGIT vials were considered as treated group. After biofield treatment, both control and treated samples were analysed after 7 days for anti-mycobacterial susceptibility as per the standard protocols. Group II:Two ATCC strains such as M. smegmatis and M. tuberculosis were revived on two separate MGIT vials. The first set of MGIT vials were considered as control and no treatment was given to this set. The second set of MGIT vials were considered as treated group. The second set of MGIT vials of both Groups I and Group II samples in sealed pack were handed over to Mr. Trivedi for biofield treatment under laboratory condition. Mr. Trivedi provided the treatment through his energy transmission process to the treatment groups without touching the samples. After treatment, all samples were handed over in the same condition and stored for analysis. Both control and treated samples were analyzed after 7 days for antimycobacterial susceptibility as per the standard protocols. The MIC was considered as the end point determination. The aim of this study was to determine the impact of biofield treatment on susceptibility patterns of anti-tubercular drugs to XRD and MDR strains of Mycobacterium. For this purpose we had selected all three generations drugs, which are used to treat both MDR as well as XDR strains (Table 1). 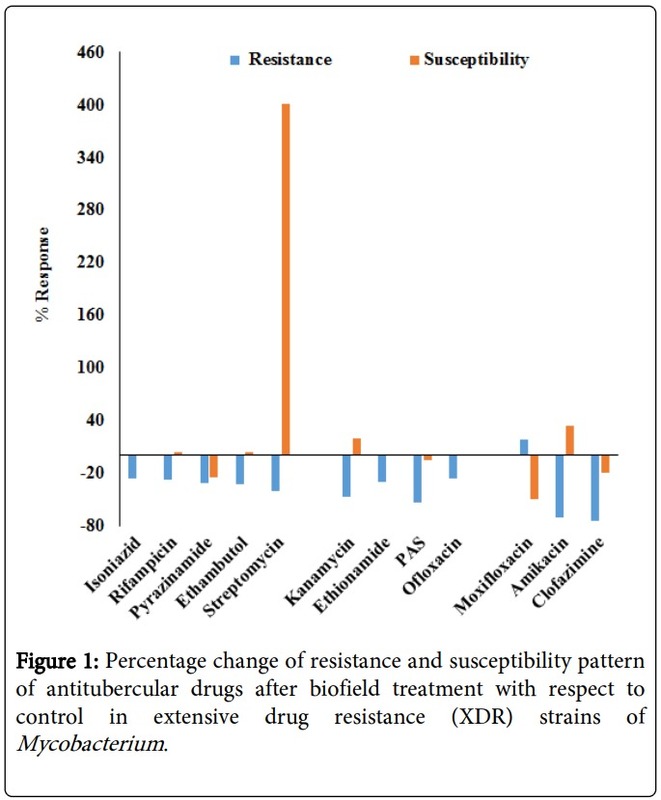 The overall alteration of responses (resistance and susceptibility) of antitubercular drugs after biofield treatment against XDR strains of Mycobacterium with respect to control are presented in Figure 1. Table 1: Percentage responsiveness of antitubercular drugs in extensive drug resistance (XDR) and multi drug resistance (MDR) strains of lab isolates. All the values were expressed as percentage of isolates. R: Resistance; S: Susceptibility; I: Intermediate; NG: No Growth. Doses: H: 0.1 µg/ml; R: 2 µg/ml; Z: 100 µg/ml; E: 2.5 µg/ml; S: 2 µg/ml; K: 5 µg/ml; Et: 5 µg/ml; P: 4 µg/ml; O: 2 µg/ml; M: 1 µg/ml; A: 1 µg/ml; Cl: 0.5 µg/ml; Ca: 1.25 µg/ml; ‘-‘ Not reported; MGIT: Mycobacteria Growth Indicator Tube System. Based on existing literatures isoniazide resistance developed due to loss of catalase activity , transformation of functional katG gene, deletions and mutation of others gene such as InhA . In this experiment after the biofield treatment resistance property was reduced 26.7% in isoniazide as compared to control; it could be due to some interaction at genetic level. Mono-resistance to isoniazid is quite common and rifampin is rare. Rifampin or rifampicin resistance occurs in Mycobacterium strains that are also resistant to isoniazid; thus, rifampin resistance can be a surrogate marker for MDR . More than 96% of the rifampin-resistant in Mycobacterium strains is due to mutation of gene encoded in β subunit of DNA dependent RNA polymerase (rpoB) [21,22]. The study results showed that rifampicin improved susceptibility by three folds and simultaneously, reduced 27.6% resistance properties as compared to control in XDR strains (Table 1). Pyrazinamide is a prodrug that converted to pyrazinoic acid by the enzyme pyrazinamidase, encoded by the pncA gene in Mycobacterium strains. Mutations in pncA results to lost or reduced pyrazinamidase activity which leads to development of resistance . In this experiment, after biofield treatment pyrazinamide reduced 31.4% resistance property in XDR strains besides increased susceptibility by four folds in case of MDR strains as compared to control (Table 1). The main target of ethambutol was mycobacterial embCAB operon that is responsible for cell wall synthesis. Due to mutation of embCAB lead to resistance against ethambutol in Mycobacterium tuberculosis, but the exact molecular mechanism of resistance in non-tuberculous mycobacteria is still unknown . In this report, after biofield treatment to the XDR strains, ethambutol decreased 33.33% resistance and simultaneously improved sensitivity about three folds with respect to control in XDR. In case of treated MDR strains, resistance property increased by 50% and susceptibility was reduced sixty six folds with respect to control (Table 1). Resistance of streptomycin was occurred due to mutations in the gene encodes to the ribosomal protein S12, rpsL . This study results showed that streptomycin susceptibility was enhanced about five folds and concurrently reduced 41.38% resistance in biofield treated XDR strains as compared to control. In MDR strains, resistance property slightly increased and sensitivity was reduced in biofield treated groups as compared to control. The resistant properties of all the second generation antitubercular drugs such as kanamycin, ethionamide, p-amino salicylates and ofloxacin of XDR strains of Mycobacterium were reduced by 46.67, 30.44, 53.84 and 26.67%, respectively as compared to control. Among them only kanamycin showed an improvement in susceptibility by twenty folds towards treated XDR strains as compared to control. Ofloxacin improved susceptibility 25.07% and simultaneously reduced resistance also by 25% in treated group of MDR strain as compared to control (Table 1). Table 2: Minimum inhibitory concentration (MIC) of antimicrobials against ATCC strains of Mycobacterium smegmatis after biofield treatment as per CLSI guidelines. MGIT: Mycobacteria Growth Indicator Tube System; CLSI: Clinical and Laboratory Standards Institute; MIC values are presented as µg/ml. Apart from first and second generations antitubercular drugs fluoroquinolones also possess antitubercular activity and it is well accepted by the scientific community. Due to its wide distribution pattern, can easily invade to an intracellular compartment of Mycobacterium and produce strong effects like macrophages without cross-resistance to antitubercular drugs [26-28]. Among them, moxifloxacin resistance to MDR-TB is very low  and highly effective to isoniazide and rifampicin resistance cases. The main targets of its bactericidal actions to DNA gyrase and topoisomerase IV . This study further indicated that there was a slight reduction of MIC value (0.25-0.12 µg/ml) of gatifloxacin which is similar to moxifloxacin after biofield treatment in Mycobacterium smegmatis (Table 2). According to George et al. amikacin and kanamycin are highly resistance to Mycobacterium . The study results also demonstrated approximately 50% reduction of resistance in both amikacin and kanamycin was found after biofield treatment in XDR strains as compared to control. Besides, the sensitivity potential of amikacin was improved by 33.35% in the treated group as compared to control in XDR strains of Mycobacterium. Extensive study reports demonstrate that clofazimine is median resistant to MDR-TB . Basically, it is designed to treat leprosy, but in MDR-TB cases it is extensively used as an alternative to TB regimens. This study results showed that about 75% resistance property of clofazimine was reduced in XDR-TB after biofield treatment as compared to control. Capreomycin is an important and preferable drug in MDR-TB against Mycobacterium smegmatis. Resistance occurs due to mutation of tlyA gene . In eight lab isolates out of 30 XDR strains did not show any growth of Mycobacterium tuberculosis after biofield treatment (Table 1). Biofield treatment might be responsible to do an alteration in microorganism at genetic and/or enzymatic level, which may act on receptor protein. While altering receptor protein, ligand-receptor/ protein interactions may alter that could lead to show different phenotypic characteristics . Based on these data, it is tempting to speculate that certain alteration in terms of antimycobacterial susceptibility happened due to biofield treatment. Overall, the results reported here demonstrate that the biofield treatment altered the resistance property in abundance number of routinely recommended antitubercular drugs against XDR strains of Mycobacterium species. It has also been observed that there were a few alterations in potency of selected antimicrobials in terms of MIC values against XDR strains of Mycobacterium. It is assumed that Mr. Trivedi’s biofield treatment could be applied to improve the sensitivity of antitubercular drugs and an alternative therapeutic approach against resistance strains of Mycobacterium. The authors gratefully acknowledge to Trivedi science, Trivedi testimonials, Trivedi master wellness and the whole team of PD Hinduja National Hospital and MRC, Mumbai, Microbiology Lab for their support. 1. O'Brien RJ, Spigelman M (2005) New drugs for tuberculosis: current status and future prospects. Clin Chest Med 26: 327-340, vii. 2. Todar K (2008) Mycobacterium tuberculosis and tuberculosis. Online text book of bacteriology. Madison, Wisconsin. 3. Zhang Y (2004) Persistent and dormant tubercle bacilli and latent tuberculosis. Front Biosci 9: 1136-1156. 4. Szakacs TA, Wilson D, Cameron DW, Clark M, Kocheleff P, et al. (2006) Adherence with isoniazid for prevention of tuberculosis among HIV-infected adults in South Africa. BMC Infect Dis 6: 97. 5. Jain P, Jain I (2014) Oral Manifestations of Tuberculosis: Step towards Early Diagnosis. J Clin Diagn Res 8: ZE18-21. 6. Running A (2015) Decreased Cortisol and Pain in Breast Cancer: Biofield Therapy Potential. Evid Based Complement Alternat Med 2015: 870640. 7. McTaggart L (2003) The Field. Harper Perennial, New York. 8. Maxwell J (1865) A dynamical theory of the electromagnetic field. Phil Trans R Soc (Lond.) 155: 459-512. 9. Burr HS (1957) Bibliography of Harold Saxton Burr. Yale J Biol Med 30: 163-167. 10. Rivera-Ruiz M, Cajavilca C, Varon J (2008) Einthoven's string galvanometer: the first electrocardiograph. Tex Heart Inst J 35: 174-178. 12. Trivedi MK, Tallapragada RR (2008) A transcendental to changing metal powder characteristics. Metal Powder Rep 63: 22-28, 31. 14. Shinde V, Sances F, Patil S, Spence A (2012) Impact of biofield treatment on growth and yield of lettuce and tomato. Aust J Basic Appl Sci 6: 100-105. 16. Trivedi MK, Patil S (2008) Impact of an external energy on Staphylococcus epidermis [ATCC-13518] in relation to antibiotic susceptibility and biochemical reactions-an experimental study. J Accord Integr Med 4: 230-235. 18. MIDDLEBROOK G (1954) Isoniazid-resistance and catalase activity of tubercle bacilli; a preliminary report. Am Rev Tuberc 69: 471-472. 19. Zhang Y, Garbe T, Young D (1993) Transformation with katG restores isoniazid-sensitivity in Mycobacterium tuberculosis isolates resistant to a range of drug concentrations. Mol Microbiol 8: 521-524. 20. Cruciani M, Scarparo C, Malena M, Bosco O, Serpelloni G, et al. (2004) Meta-analysis of BACTEC MGIT 960 and BACTEC 460 TB, with or without solid media, for detection of mycobacteria. J Clin Microbiol 42: 2321-2325. 21. Telenti A, Imboden P, Marchesi F, Lowrie D, Cole S, et al. (1993) Detection of rifampicin-resistance mutations in Mycobacterium tuberculosis. Lancet 341: 647-650. 22. Zhang Y (2000) Genetics of drug resistance in Mycobacterium tuberculosis. In: Hatfull G, Jacobs WR (eds) Molecular genetics of mycobacteria. ASM Press, Washington, DC. 23. Juréen P, Werngren J, Toro JC, Hoffner S (2008) Pyrazinamide resistance and pncA gene mutations in Mycobacterium tuberculosis. Antimicrob Agents Chemother 52: 1852-1854. 24. Alcaide F, Pfyffer GE, Telenti A (1997) Role of embB in natural and acquired resistance to ethambutol in mycobacteria. Antimicrob Agents Chemother 41: 2270-2273. 25. Springer B, Kidan YG, Prammananan T, Ellrott K, Böttger EC, et al. (2001) Mechanisms of streptomycin resistance: selection of mutations in the 16S rRNA gene conferring resistance. Antimicrob Agents Chemother 45: 2877-2884. 26. Ginsburg AS, Grosset JH, Bishai WR (2003) Fluoroquinolones, tuberculosis, and resistance. Lancet Infect Dis 3: 432-442. 27. Di Perri G, Bonora S (2004) Which agents should we use for the treatment of multidrug-resistant Mycobacterium tuberculosis? J Antimicrob Chemother 54: 593-602. 28. van den Boogaard J, Kibiki GS, Kisanga ER, Boeree MJ, Aarnoutse RE (2009) New drugs against tuberculosis: problems, progress, and evaluation of agents in clinical development. Antimicrob Agents Chemother 53: 849-862. 29. El Sahly HM, Teeter LD, Jost KC Jr, Dunbar D, Lew J, et al. (2011) Incidence of moxifloxacin resistance in clinical Mycobacterium tuberculosis isolates in Houston, Texas. J Clin Microbiol 49: 2942-2945. 30. Manjusha P, Sangita S, Anita C, Usha VN, Loraine S (2011) In vitro antimicrobial susceptibility of moxifloxacin and rifabutin against Mycobacterium tuberculosis. Int J Pharm Res Dev 3: 53-56. 31. Alangaden GJ, Kreiswirth BN, Aouad A, Khetarpal M, Igno FR, et al. (1998) Mechanism of resistance to amikacin and kanamycin in Mycobacterium tuberculosis. Antimicrob Agents Chemother 42: 1295-1297. 32. Xu HB, Jiang RH, Xiao HP (2012) Clofazimine in the treatment of multidrug-resistant tuberculosis. Clin Microbiol Infect 18: 1104-1110. 33. Maus CE, Plikaytis BB, Shinnick TM (2005) Mutation of tlyA confers capreomycin resistance in Mycobacterium tuberculosis. Antimicrob Agents Chemother 49: 571-577. 34. Lindstrom E, Mild KH, Lundgren E (1998) Analysis of the T cell activation signaling pathway during ELF magnetic field exposure, p56lck and [Ca2+] i-measurements. Bioeletrochem Bioenerg 46: 129-137.